This is Heli from Heli's Little Friends. I'm a designer with a focus on babies and children. I have 3 of my own little darlings and I know what works! Precious moments are fleeting so keep them safe with professional looking pictures without the expense of a photographer. Heli's Little Friends Multi-function minky, flannel blanket. A soothing white blanket one side and a sweet, gender neutral backdrop for your monthly pics on the other. * The softest, plush baby blanket - 47 x 47 inches. * Bonus Frame to indicate the month. * Bonus Matching greeting card. Why Heli's Little Friends Blanket? * Show off your baby's personality as he grows from month to month with his favorite toys. Look back and remember what he/she was doing each month of his/her first year. Being wrapped in a soft, pampering blanket makes your child feel safe and calms them quickly. This plush fabric has the same calming effect on the stressed parent. When you're calm, so is baby! The Perfect Gift from friends or family for expecting parents, baby shower or newborn. Suitable for boys or girls alike. Use the bonus greeting card to let everyone know who bought this fabulous blanket. At Heli's Little Friends we pride ourselves on our service. So join our little family and BUY NOW while stocks last. In the event of any issue just return within 30 days for a FULL REFUND. SO SIMPLE TO CREATE PROFESSIONAL LOOKING MEMORIES THAT LAST A LIFETIME. Babies grow and change so quickly in their first year. Mom and Dad, this is the easiest way to keep a record of your baby's growth and advancement! No posing, no special props, just this plush baby blanket backdrop, the bonus frame for the number of the month, your baby and a camera. The perfect newborn photography props and newborn blankets. THE LIGHTEST WEIGHT, SOFTEST, THICKEST, COMFORTING, COZY FLANNEL FLEECE BLANKET: Made of premium quality 300gsm polyester, it is the highest quality you will find on Amazon. At 47 x 47" A perfect baby receiving blanket; A monthly record of your baby's growth and advancement during the first year; A soft, comforting swaddle for your infant or toddler to cuddle up with and enjoy in the crib, in the stroller or in the car. Design on one side and plain white on the other. A TRULY UNIQUE UNISEX BABY BLANKET GIFT! A special limited edition design by Heli's Little Friends with high quality printing! The colors are soft on the eyes of the baby but vibrant enough to make great photos. Perfect size for up to 12 months for photos but toddlers will still love to cuddle up in it. The blanket comes gift wrapped with a ribbon and we've even included a matching greeting card for you to give. Best choice for baby shower gifts and newborn gifts! Excellent solution to capture milestones for your baby! 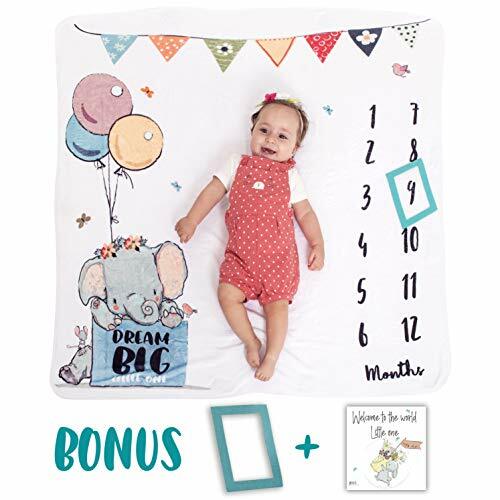 using our adorable baby milestones blanket with the cutest elephant, It is so easy to capture baby milestone. BUY NOW and enjoy this limited edition! Grandma and Grandpa, aunts and uncles, if you want to receive monthly milestones baby pictures to show off to your friends, buy this blanket for the new mom and dad. Every time they use it they will think of you! This is a no-risk purchase, if you are unhappy in any way, return within 30 days for a full refund. 100% Service 100% of the time! If you have any questions about this product by Heli's Little Friends, contact us by completing and submitting the form below. If you are looking for a specif part number, please include it with your message.